How are blue, right, fin, sei, humpback, fin whales, the large species found in Antarctica, adapted to survive in the cold oceans? The largest animals ever to have lived, larger than any dinosaur, their huge bulk being supported by the sea. Not exclusively Antarctic animals but often found in the frigid waters in both north and south polar regions. 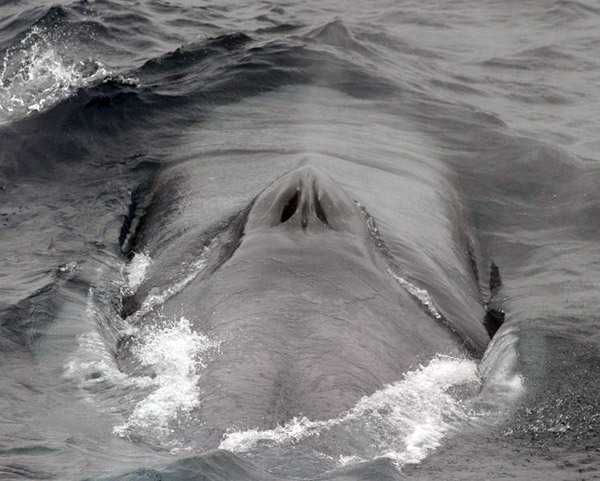 Large whales are able to live indefinitely in the coldest seas on earth. If you were to fall into the Antarctic Ocean, you would have about 15 minutes before hypothermia set in, at this point you may pass out and drown, in any case you would be dependent on someone else to get you out of the sea, even if you were kept afloat with a life vest you would be dead in 60-90 minutes. Whales however can live at the same temperatures indefinitely, if healthy and reasonably fed, they just don't get hypothermia - ever. The reason for this is that a large size with a low surface area to volume ratio, and a blanket of blubber around the whole animal below the skin mean that metabolic heat is retained to the degree that the coldest seas are permanently survivable. Baleen plates in the mouth instead of teeth to filter food in bulk from seawater. These are made of keratin, the same tough protein that makes hair, skin, nails, hooves and horns. There are two rows of plates that hang down from the upper jaw forming two upright sides of a triangle with the lower jaw being the third side. The inner edges of these plates are bristly filters to collect food, usually smallish very numerous animals such as krill in the water they gulp in. A huge mouthful of water + food is taken in and the mouth closed, then the water is ejected by the tongue while the food is filtered out and trapped inside the mouth to be swallowed when the water has gone. 55 - 68 ventral grooves that extend from the lower jaw to the navel (yes, whales have a belly button!) These allow a huge amount of water and food to be taken into the mouth allowing it to expand to about 6 times larger than normal size (sometimes a bigger volume than the whale itself). The largest whales (blue whales) can eat up to 4 tonnes of food a day in the Antarctic summer, they can feed for about 8 months and then fast for 4 months living off their fat reserves. Large whales have stretchy nerves in the muscle of the floor of the mouth to allow for that expansion with water and food to take place. This might not seem very significant, but nerves are generally delicate structures and any stretching will usually cause serious damage. The nerves in this part of the baleen whale are elastic with a cord limiter to prevent damage by over-stretching so preserving the still fragile structure of the neurones that carry impulses to the muscles that expel the water from feeding. Lunge feeding may be a key development in allowing whales to reach their enormous size, so stretchy nerves could be a vital component in the evolution of large whales. 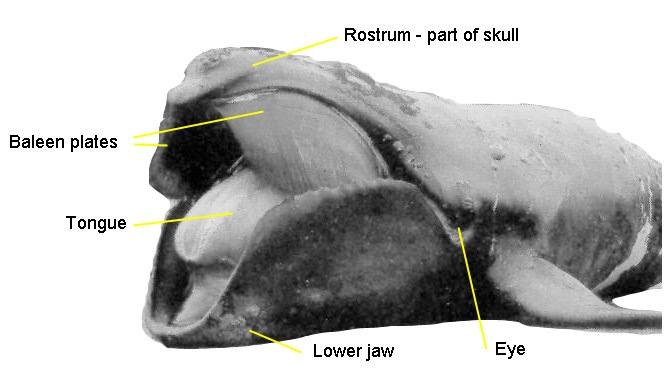 A ridge in front of the blowholes (the two nostrils) which are located on top of the head. Pointing backwards means that they are not filled with water when swimming, being placed on top of the head makes it easy to breathe while surfacing and lifting the smallest amount of the body possible, like a short snorkel. A huge tail fin the size of two dinner tables that provide the main propulsion for swimming. The smaller forward fins are for changing direction and the small dorsal (mid-back) fin helps with stabilizing straight swimming, it is the tail that provides the power. Bubble netting. A feeding technique practised by humpback whales, one or two whales dive down below a shoal or swarm of prey, fish or invertebrates, they then slowly swim vertically upwards towards the surface in a spiral. They blow bubbles as they swim which float up in a circle and panic in towards the centre. The whale/s then dash straight up through the middle with their mouths open and get a more concentrated mouthful of food. Other whales may come in at this point too, as the prey flee one predator, they are more likely to blunder into the path of another, so co-operative feeding helps them all. Lunge feeding. This is a technique whereby the whale approaches a concentration of prey in the water and then lunges at them with its mouth wide open and the floor of the mouth distended enormously to engulf they prey and a large volume of water at the same time. The water is then pushed out over the baleen plates with the food being filtered out, so it is a sort of batch filtering process. It may be combined with bubble netting and/or co-operative feeding with other whales to help concentrate the prey for the most satisfying mouthfuls. Migration - Many whales migrate to the polar regions during the summer months of that region. There are often distinct southern and northern populations of species which go to their respective pole, none go to both poles. They feed continuously during the super-productive summer months and then live entirely on their blubber reserves for about 4 months during the breeding season in warmer waters. Not all individuals migrate however and in recent years, some humpback whales have been found around Antarctica during the winter rather than 7,000km (4,350miles) away off the coast of Africa where they were thought to be. 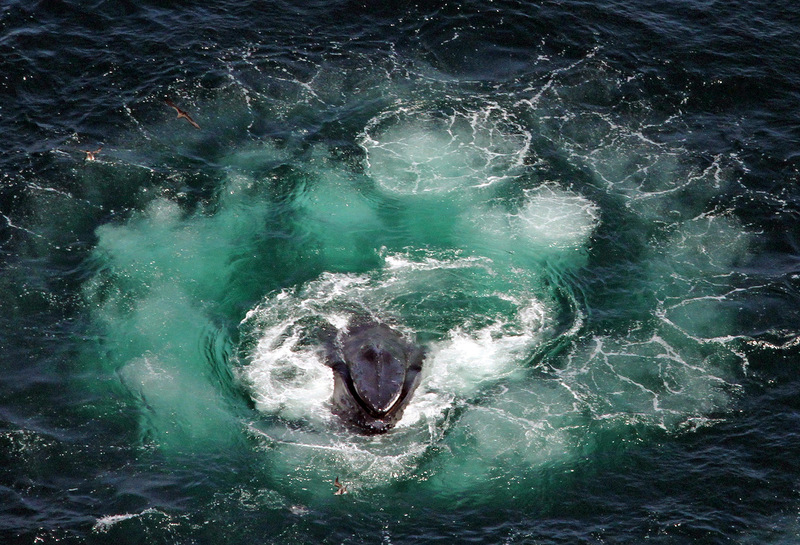 Whales use sound to communicate with each other and also possibly as a means of finding krill swarms. 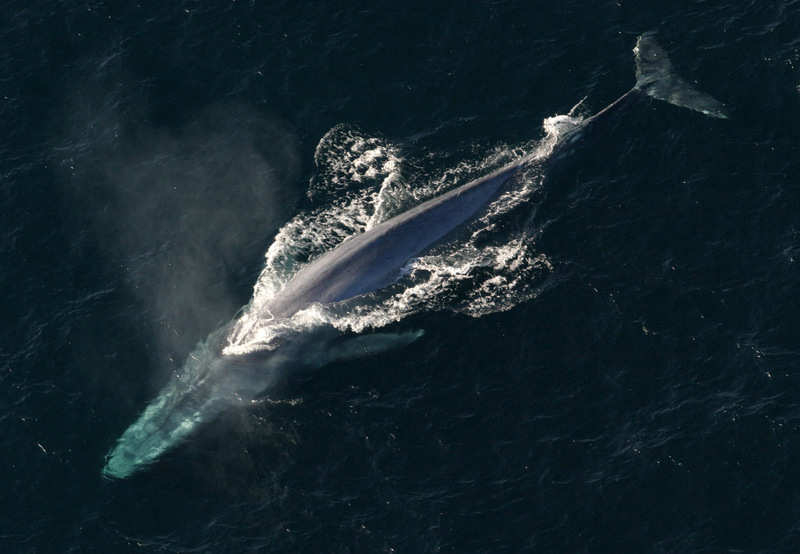 Blue whales make the loudest noise of any animal at 180 dB or more. These sounds can travel underwater for as far as 500 miles (800 km). They are very low frequency sounds down to 14hz, below the hearing limit of humans, though they can be felt by divers in the water at the time. Large whales have enormous appetites, adult blues have a daily energy requirement in the region of 6.3 million Kilojoules (1.5 million kilocalories). This is supplied by up to 3.6 tonnes or about 40 million individual krill eaten per day which all have to be processed by the digestive system. This drives the "inner furnace" of metabolic heat which keep the animals comfortable and active in temperatures that would result in hypothermia and death in most mammals in just an hour or two. Like other air breathing diving animals such as seals, and penguins, whales have muscles rich in myoglobin. This is an iron containing protein similar to the haemoglobin that carries oxygen in the blood, but provides an extra in-situ store for longer dives exactly where it is needed deep in the most active muscles. 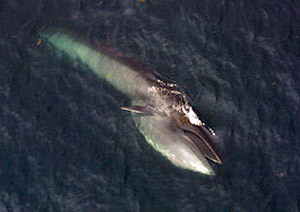 Their metabolism is able to cope with extended periods of plenty where extensive feeding allows the build up of many tonnes of blubber (stored fat) which is then used up during extended periods of starvation, 8 months feeding, 4 months with no food, but living off the reserves that were built up.